With the iQSE the clutchless, full throttle shifts are not only quick but effortless too. Now you can shift like a pro! The quickshifter cuts the ignition at the moment you start moving the shift lever. The gearbox is unloaded, making it possible for you to switch one gear up without closing the throttle. By the time the spark comes back, you&###x2019;re already in the next gear &###x2013; no hassle, no glitch, no time loss. The iQSE is not only chosen by racers, but more and more street riders too due to the simple installation and affordable price. For street riders the benefit is improved control and comfort, and to put it simply, &###xA0;MORE FUN! &###xA0;It really makes all bikes more fun to ride, including classic and touring bikes too. As easy as it can get The product was designed with the average rider in mind to make the installation and setup as simple as possible, yet it has all the features needed for pro racers too. Supreme compatibility One sensor that works on all motorcycles, also with reverse (race) shift pattern. Plug &###x2018;n Go harness kits are available for most bikes. Compatible with all our products too. Small yet powerful The iQSE module comes in a small package so you don&###x2019;t have to sacrifice your under-seat storage space. 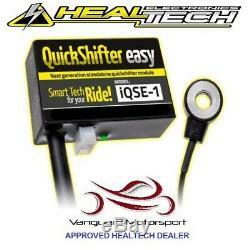 Wireless connectivity The iQSE is the only quickshifter module on the market which utilizes Bluetooth technology and iOS + Android app for setup and verification. Can even be disabled with a few taps to restore factory condition e. We offer free and automatic software updates for the lifetime of this product. Even the module firmware is updated automatically via Bluetooth (with our zero-risk technology) which makes the product future proof. We have a 250i Dynojet Dyno with workshop for all your fitting ant tuning needs. If you have any questions, please get in contact with us and we will be happy to help. Vanguard Motorsport Ltd are dedicated to customer service and satisfaction. With over 30 years of industry experience, we live and breathe motor sport, especially the two wheeled variety. The company was built many years ago and has grown from strength to strength over the years where we have built a vast knowledge and passion for all things motorcycle. We started back in the day, competing in road racing at the grass roots and quickly progressed into British Super Bike and European level racing. Here we started building bikes and running our own race team from which the companies foundations were built. We soon became recognised for our level of customer care, bike build quality, tuning and dedication to our sport. We only offer the very best equipment, guidance and advice that we have learnt over 30 years to better our customers riding experience and enjoyment. So if you need the latest and greatest upgrade, help with upgrading and tuning, comfort or aesthetic upgrades, advice or just want to chat about the best options for you and you bike, give us a call. We have our own work shop and Dyno facilities and have a wealth of knowledge and experienced staff to work on any type of bike whether it be road, road race or moto x. We are here to help and look forward to hearing from you. The unit must be as new, unused, undamaged and where applicable not have been installed. This listing is currently undergoing maintenance, we apologise for any inconvenience caused. The item "Triumph Daytona 955i 1997 2001 Healtech Quickshifter Approved Dealer" is in sale since Saturday, December 1, 2018. This item is in the category "Vehicle Parts & Accessories\Motorcycle Tuning & Styling". The seller is "vanguard-motorsport-ltd" and is located in Sussex. This item can be shipped worldwide.